Have you seen the movie "Chef" with Jon Favreau and Sofia Vergara? If not, you should. It's on Netflix right now. It's one of my favorite movies because it has all of the things that give you the feel goods. Relationships, humor and a comeback... a guy finding himself again and following his dreams with the help of friends and family... and a lot of tweets. I love the integration of social media in the movie. In fact, that's how it all starts. I won't spoil the plot, but let's just say, things get crazy on Twitter. Jon's character shows us what not to do and his savvy son shows us what to do. 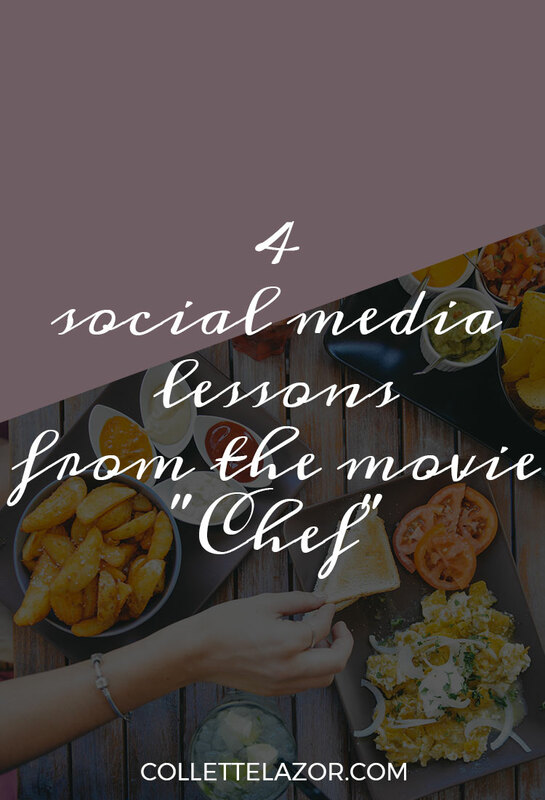 So, here are 4 social media lessons from the movie. 1 // Don't post your first message before running through the starter tutorials. All platforms have them and they are a quick way to learn the basics. So, you'll know things like the difference between a public tweet and a private direct message. Something he didn't... which got him in big trouble! 2 // Don't post in anger, unless you're ready for the consequences. Whether you're posting for a brand or yourself, remember that it's all public and searchable. Don't do something you'll regret out of haste. There are always a few stories a year that remind us of this. Keep a level head when posting! 3 // Do use hashtags in the search field to find relevant conversations about a topic. Once the "incident" happened, that's how he found all of the comments. Track mentions, variations of your brand and topics to see the negative and positive things people are saying. 4 // Do share behind-the-scenes, creative content about the journey. His son helped by creating a social following (after said dream was discovered) by sharing pictures of their travels and food, posting their next location and being genuine with their fan base. Bonus life lesson from the movie: find you passion and share it.